We were appointed to design a contemporary extension to a historic listed converted barn in Landscove. Due to the sensitivity of the site and the special character of the existing building, we worked very closely with the conservation team at South Hams District Council and had to create something exceptional for this project to be a success. The extension creates much needed additional living and dining space for a growing family and facilitates a dramatic connection to the existing garden and surrounding landscape by virtue of a large open corner sliding/folding glazed door. The copper clad asymmetric roof volume is a counter play to the open corner below and has two tapered rooflights bringing in top light during the day and allowing views out for stargazing at night. A further window adjacent to the dining space features external oak slats to create privacy from the neighbouring house, but also creates dramatic light play and shadow within the extension. 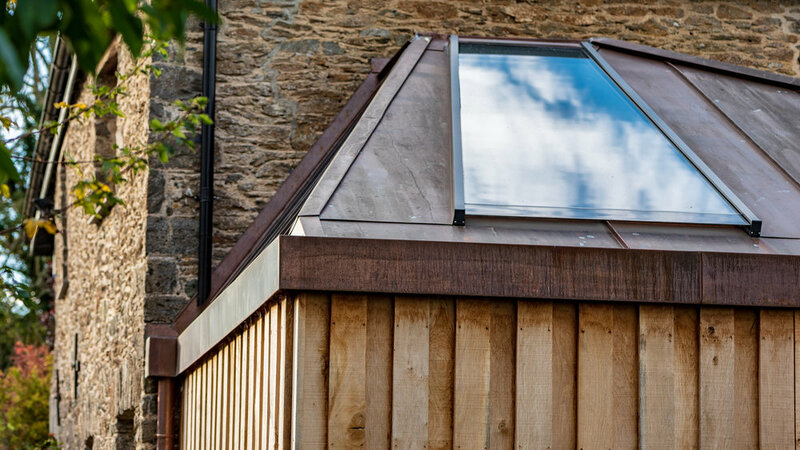 The copper roof and external natural oak cladding will weather beautifully over time to ensure this modern extension sits in harmony with the original stone barn.